This guide is intended to be used in conjunction with the Penn Manual, a web-based resource and guidance document on how to conduct clinical research at Penn. 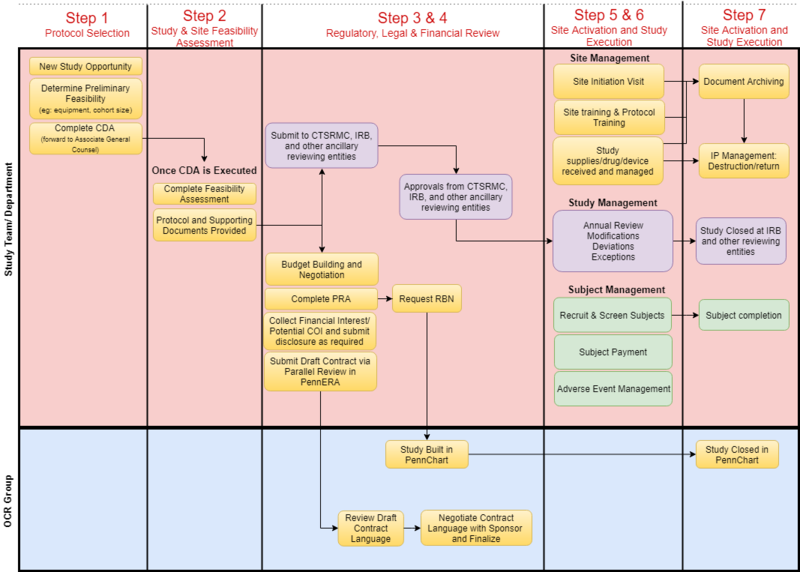 This document gives an overview of required steps for any given Industry Sponsored Clinical Trial. Throughout the guide there are links to forms and Penn Manual pages to help you navigate through Penn Medicine’s research landscape. Listed below are the basic functional steps to help Investigators and their team navigate clinical research from start-to-finish. 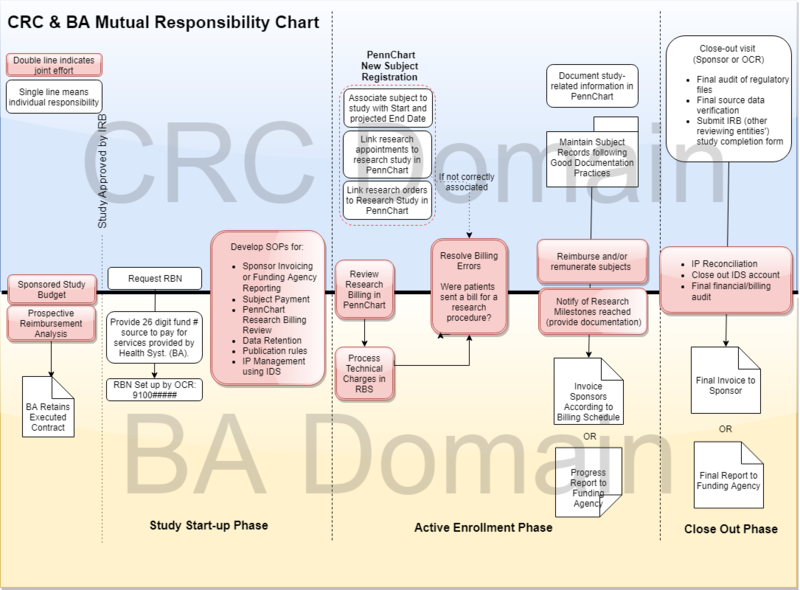 The Business Administrator (BA) and Clinical Research Coordinator (CRC) should communicate routinely throughout the lifecycle of the study to make sure that the finances of the study are accurate. A summary of their collaboration is depicted below. Key Research Roles and their responsibilities can be found here. CDAs to enable review of protocols from companies are reviewed by an Office of General Counsel lawyer and signed by the Executive Director in ORSS and/or the Principal Investigator (based on sponsor’s requirements). Some sponsors may come out to Penn for a pre-study site visit. Obtain protocol, case report forms, investigational product information, monitoring plans, logs, etc. This material is referred to altogether as the Regulatory Binder or Study Administrative File. For corporate-sponsored studies, budget negotiation is between the sponsor and the site (specifically the study team’s BA). The Sponsor will usually offer a budget template to the site. The BA is responsible for the budget, but OCR Finance is available to assist with budget negotiations, if needed. Cancer-related protocols require a UPCC# in addition to an IRB#. PennCTMS (commonly referred to as Velos) is the Clinical Trials Management System (CTMS) for all cancer-related trials. You will need access to PennCTMS to submit a cancer-related protocol for initial review. The PI must play a role in the ongoing monitoring and oversight of his/her protocol. If the protocol is cancer-related, a Monitoring Plan must be submitted to the DSMC to gain CTSRMC approval. If a Medical Monitor will monitor the protocol, s/he cannot also be the PI. Budget negotiation may be the responsibility of the investigator, CRC, BA or other research staff; budget approval is the responsibility of the business office. Standard of care means: usual and reimbursable cost. Sponsors will often provide reimbursement language in the contract. The study team (CRC/BA/PI) is responsible for providing an accurate assessment by filling out the Prospective Reimbursement Analysis (PRA). If the protocol involves the use of an investigational agent/device within the Operating Room, please contact surgical services. FIDES is a web-based application to report financial interests and relationships related to participation in specific research projects. It is recommended that you notify OVPR once this is finalized. Non-budget contractual terms are negotiated by CTCU; requests are submitted via a parallel review form; once non-budget terms and budget are negotiated and internal school approvals are obtained, the contract is signed. For additional information contact CTCU. Obtain account numbers to track standard of care accounting for billing purpose. Prepare study budget as per sponsor agreement for payment milestones. Keep regulatory files in a secure area per Sponsor requirement. Sponsors usually provide information on how they want the regulatory binder organized. This can be an on-site visit, or an investigator meeting. If the Sponsor has agreed to provide supplies/drug/device, they will be shipped around the time of study activation. Make sure the space is secure and meets the requirement for storage (light/humidity/temperature, etc). Develop a training agenda for study staff not trained by the sponsor. Document training. Sites should have agreed upon screening method. No study-specific procedures may take place until the ICF is signed. The time and procedures for subject follow-up will be determined by the study protocol’s endpoints. All follow-up assessments and documentation should be completed, recorded, and sent to Sponsors per protocol. Re-consent as needed. Submit subject remuneration/ reimbursement to BA in a timely manner. Document payment submission. Procedures for handling AE and SAE will vary by Sponsor. Make sure you know of the proper reporting process for your study. Some Sponsors ask that you report AE/SAE to CRO instead of them directly. The Sponsor may send a Study Monitor (also known as a CRA) periodically to review and assess the progress of the study. Most reviewing entities require that you submit a Continuing Review form annually. Submit items to Sponsor/CRO before submitting to IRB and other reviewing entities. Modifications can range from changes in the primary or secondary outcomes, changes in follow-up procedures. Or just the addition/removal of staff. Distribute submissions and final approvals to all relevant reviewing entities, staff, and Sponsor contacts. Modification- how to submit to the IRB. Deviations are a one-time, unintentional action that does not follow the protocol. Sponsors may have their own reporting requirements. Forward all documentation to relevant reviewing entities. Determine whether or not a protocol amendment is needed to prevent further deviation. Deviation - how to submit to the IRB. If the deviations compromise the safety and welfare of subjects, it must be reported within 10 business days to the IRB. Exceptions are a one-time, intentional action that does not follow the protocol but is approved by the IRB prior to the occurrence. Speak to your sponsor first before submitting an exception to the Penn IRB. Circulate to all relevant reviewing entities and study staff members. Exception – how to submit to the IRB. You must get the Exception approved by both the IRB and Sponsor before the exception from the protocol is implemented. Schedule close-out visit with Sponsor/CRO. Obtain IRB termination letter and forward to Sponsor and relevant reviewing entities. Work with BA to develop content for the financial component of a study close-out. Complete Investigational Product inventory assessment. Return or destroy product/supplies according to Sponsor/CRO instructions. The University Records Center provides a service to dispose or store research study documents.